Chembra Peak (ചെമ്പ്ര കൊടുമുടി) is the highest peak in Wayanad, at 2,100 m (6,890 ft) above sea level.Chembra is located near the town of Meppadi and is 8 km (5 mi) south of Kalpetta. It is part of the Wayanad hill ranges in Western Ghats, adjoining the Nilgiri Hills in Tamil Nadu and Vellarimala in Kozhikode district in Kerala. Chembra Peak is accessible by foot from Meppady. District Tourism Promotion Council provides guides and trekking equipment on hire charges to tourists. One can reach the forest office, from where a pass has to be acquired to trek the mountain. Also services of a guide can be availed, which might be very useful. 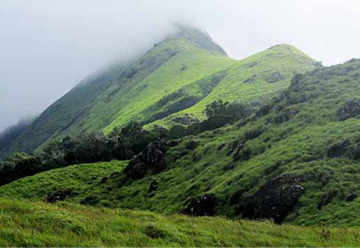 The trek to the top takes 3 hours, and one can see almost the whole of Wayanad. Chembra is located in Meppadi (Meppady) Panchayath, 11 km (7 mi) off NH212 (Kollegal – Mysore – Kozhikode). For people who prefer public transport, KSRTC (both Kerala & Karnataka) and a lot of private companies operate overnight deluxe buses between Kozhikode (aka Calicut) and Bengaluru. People taking buses can get down at Kalpetta and catch another bus to Meppadi. Meppadi is 10 km from Chundale, in the SH29, connecting Chundale to Ooty.